Super Pop Max - 16 oz. 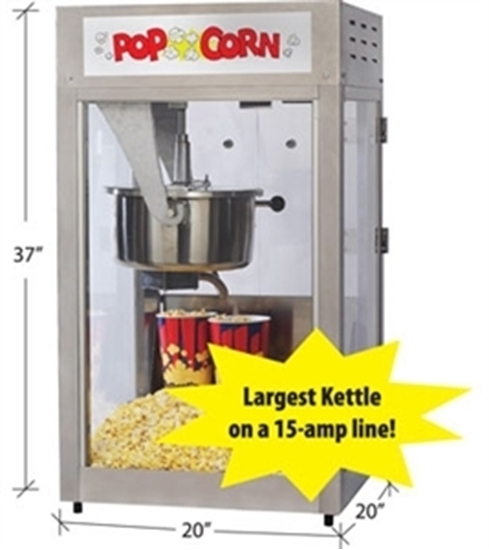 Pop lots of popcorn where you don't have a lot of space! This popper has a large Popping Capacity on a standard 15 amp line. The Super Pop Maxx offers the benefits of Unimaxx kettle in a 16-oz. popper with the smaller footprint of a Pop Maxx. The Unimaxx has a unified kettle and heat element to permit the lowest possible energy consumption with maximum popping capacity. Serves 240 (1oz) servings per hour.